Powerhouse: Junior guard Jalen Jones and fellow teammates are getting noticed nationally after high-profile wins. The Maverick men’s team is off to its best start in years, and now it’s time to cheer them on against regional rival North Texas 7 p.m. Thursday, Dec. 3, at College Park Center. After a season-starting win over Fordham followed by a loss to Louisiana Tech, the team followed with four high-profile wins: 73-68 over Ohio State, 68-64 over Memphis, 73-40 over Grambling State, and 92-74 over Rice. 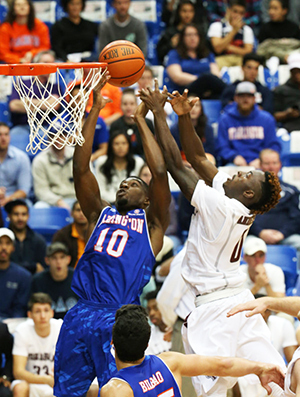 UTA takes on Texas at 7 p.m. Tuesday, Dec. 1, in Austin. The Longhorn Network is televising with the radio broadcast airing on KKGM 1630 AM. For fans unable to make the trip, Grease Monkey is hosting UTA's official watch party with food and drink specials. In an interview with KERA News, head coach Scott Cross says team developed chemistry in the preseason. "You could see bonds being built during that time. They were singing ‘Lean On Me’ as a team together, they were hanging out all week long with each other," Cross says. "You could just see that they liked each other off the court, and I think you’re seeing that on the court." 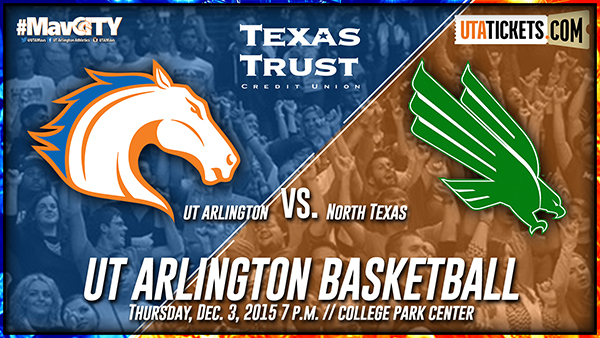 Thursday's game at College Park Center features Maverick and Texas Trust Credit Union T-shirt giveaways and team autographs after the game. Single game tickets are $3 for students and $7-20 for the public. Take advantage of the Student All-Sports Pass for $25 and catch all home athletic competitions. For these and other ticket options, go to utatickets.com. The team heads to UT El Paso for an 8 p.m. game Saturday, Dec. 5, then plays Bradley at home at 7 p.m. Tuesday Dec. 8. The Lady Mavs basketball team approached all-time records in its 96-30 win over Missouri Valley College on Saturday at College Park Center. The team is 2-3 for the season. The women are on the road against Stephen F. Austin on Tuesday, Dec. 1, and Kansas State on Thursday, Dec. 3. They play Western Kentucky at 2 p.m. Sunday, Dec. 13, at College Park Center. Follow Maverick athletics at utamavs.com. 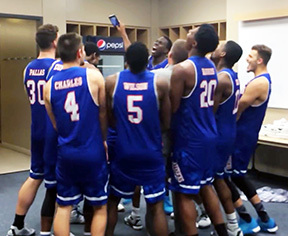 Who's taking that selfie while the rest of the Mavericks men's basketball team howls? Find out by watching the post-game video recorded after the Mavs whipped Memphis 73-40. Peer educators are students who are successful in their courses and have completed at least one semester of coursework at UT Arlington. Applicants must have a 3.0+ GPA (cumulative) and have earned an A or B in the course for which they are applying. Students should also have great communication skills, excellent leadership qualities, and have a positive attitude. The Information Security Office has published Security Standards and Guidelines on how to secure your personal mobile devices. Fist day of class fo winter intersession. The holiday season starts Wednesday, Dec. 2, with four programs using a full-color, 360-degree laser projector at The Planetarium at UTA. 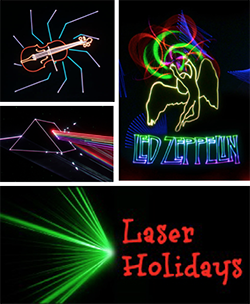 Enjoy music mixed with laser lights in Laser Country, Laser Holidays, Laser Pink Floyd, and Laser Zeppelin. Other holiday favorites featured this month are Holiday Music Magic and Season of Light as well as One World/One Sky, Cosmic Colors, Spacepark 360: Infinity, and Secret of the Cardboard Rocket. The Planetarium will be closed Fridays, Dec. 24 and 30. Men's Basketball Mavericks vs. North Texas. Tickets $3 students, $7-20 public. 7 p.m., College Park Center. Also, vs. Bradley, Tuesday, Dec. 8; vs. Sul Ross State, Holiday Hoops, Monday, Dec. 21; vs. Georgia State, Wednesday, Dec. 30; vs. Georgia Southern, 7:15 p.m. Saturday, Jan. 2. Athletics. Holiday Lights Parade Entertainment starts in Founders Plaza at the Levitt Pavilion at 2 p.m., and the parade begins at 6 p.m. at the corner of Main and Center streets in downtown Arlington. Look for UT Arlington floats. Free. Holiday Lights Parade. Maverick Dance Company: Via Dance A collection of progressive dance works by faculty, guest, and student choreographers. Tickets $7 students, faculty, staff, seniors; $10 general public. 8 p.m., Mainstage Theatre, Fine Arts Building. Also, Saturday, Dec. 12. Theatre Arts. Women's Basketball Mavericks vs. Western Kentucky. Holiday Hoops. Tickets $3 with student ID; $7-20. 2 p.m., College Park Center. Also, vs. Georgia State, 5 p.m. Wednesday, Dec. 30; vs. Georgia Southern, 5 p.m. Saturday, Jan. 2. Athletics. Late Night Breakfast 9:30 p.m., Connection Cafe, E.H. Hereford University Center.